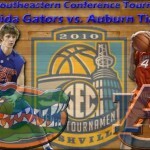 Coming off three consecutive losses, the Florida Gators were looking to strengthen their case for a berth in the 2010 NCAA Tournament Thursday night against the Auburn Tigers in the opening round of the 2010 Southeastern Conference Tournament at Bridgestone Arena in Nashville, TN. Junior forward Alex Tyus helped them do just that, scoring a team-high 24 points on 11-of-16 shooting to propel the Gators (21-11, 9-7 SEC) to a 78-69 win over the Tigers (15-17, 6-10 SEC) and a berth in the tournament’s quarterfinals. Florida, looking to avenge a loss to Auburn in the quarterfinals of the 2009 SEC Tournament, was carried by Tyus, junior F Chandler Parsons and redshirt junior center Vernon Macklin in the first half. The trio combined to go 13-for-19 from the field while scoring 33 of the Gators’ 40 first-half points. Tyus continued his excellent play in the second half and was joined by freshman guard Kenny Boynton, who nailed three consecutive three-pointers and finished with nine points. An early trey from Parsons gave Florida a 7-5 lead in the first half, which they would end up retaining for the remainder of the contest. A subsequent 20-5 run jumped the Gators out 20-10, while a Tyus dunk at 9:38 provided them with a game-high 14 point advantage. A 7-0 run by Auburn cut their deficit to six, but a wide-open three by senior F Dan Werner to end the half kept Florida up nine going into the locker rooms. The Gators came out cold in the second half, missing their first seven shots as the Tigers went on an 8-0 run to bring the game within one, 40-39. That would not last long, as Florida utilized Boynton’s trifecta of treys to boost them through a 13-0 run that brought UF back up 55-41, tying their game-high 14-point lead. Seven straight points by Auburn G Frankie Sullivan closed the gap to 60-54 with 6:16 to go, but a powerful block by Tyus at 5:36 permanently reversed the momentum back in Florida’s favor. Tyus added five rebounds to his 24 points, and Parsons followed suit with 21 points and six rebounds of his own while shooting 7-of-12 from the field and 3-for-4 from beyond the arc. Werner and sophomore point guard Erving Walker each posted a team-high seven rebounds, though Walker added six points and six assists and Werner contributed five points. Macklin was good for 10 points and a game-high three steals. As a team, the Gators shot 46.7 percent (7-of-15) from downtown while limiting the Tigers to 16 percent (4-of-25). Sullivan finished with a game-high 25 points (10-of-17) for the Tigers as G Tay Walker was held scoreless. Auburn G DeWayne Reed scored 18 points, and F Lucas Hargrove contributed 11 along with nine rebounds. 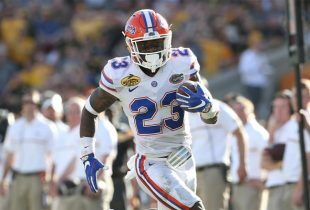 Florida advances to face the SEC West No. 1-seed Mississippi State Bulldogs on Friday at 7:30 p.m. in SEC Tournament quarterfinal action. The game will air live on the SEC Network and ESPN360.com – check your local listings for availability. Hey, I like the new look of OGGOA! Man, it can be frustrating to watch this team. They get a 10-12 point lead and then goof around and find themselves in a dog fight. Sometimes they don’t look like they even belong in the NIT! But one more and they will certainly be in, might even be in now. Maybe that will finally be the re-building block that Billy needs to get this program back on track to running with the big dogs. No, I don’t expect them to do squat if they make the tourney, but I think the experience could be invaluable and again, something, ANYTHING they can build on. We need a Brandon Knight to say yes with the rest of this recruiting class and with the current guys continued development…could be right back in it! Great night. Yes, this team can be tough to watch at times, but how many teams aren’t? you don’t think KY fans go nuts when they can’t hit a jumper? How are Villanova fans doing these days? And Texas fans must be thrilled with that #1 ranking obtained just, what, 3 short months ago? That’s college basketball in 2010. I was thrilled with the effort after the first 5 minutes of the 2nd half. Plus, with the way the rest of our fellow bubble teams performed we may have already punched our ticket. Memphis, UAB, AZ State, Cincy all fell. SDSU escaped with a win and Washington is just about to tip. Heck even Wake, who Lunardi called a “lock” just days ago went out and got their doors blown off by a woeful Miami team. I know we have some tourneys left to wrap up and things happen but win or lose tomorrow night, I believe we are heading back to the dance… finally. RR, BK’s not saying yes to us. Rivals radio has all but wrapped him up to KY. Selby, who hates BK, is looking elsewhere (Kansas) because he sees the writing on the wall. That’s ok. Long term, McCallum in 2010 and Rivers in 2011 make us a better team for years. Also, Duke is seeing the Rives to Gainesville writing- they just got a commit from another 2011 guard. Casey Prather- another wingman but this one with a tremendous basketball IQ, a little like Werner in that respect but with you know athletic talent and the ability to take it to the rim and score. Jumper needs work. and then hopefully Ray McCallum should we get him to leave Dad and Detroit and come play the point. Sliding Walker to the bench guard, even the 2 behind Boynton would be tremendous. No bigs yet in 2011. Give BD the summer. Don’t count your chickens on Ratliffe yet. I heard the Gators have backed off him a bit. Then again, anything is possible. Billy better go get some guards if this program is ever to return to top 25 or even hope to challenge Ky. There was a day when he could recruit right along with those guys. Now it looks like Tenn will have to carry that banner as we have slipped to middle of the pack. I tried e-mailing you, but the one listed on your posting account did not work. Can you please send me an e-mail at adam@onlygators.com? Thanks.